JALBCA’s Annual Awards Presentation and Installation Dinner, which was celebrated at Cipriani’s Wall Street on May 12, 2014, drew an impressive crowd of approximately 750 people and was a resounding success. Guests convened to install the new officers, directors and advisory board members, honor outgoing Co-President Hon. 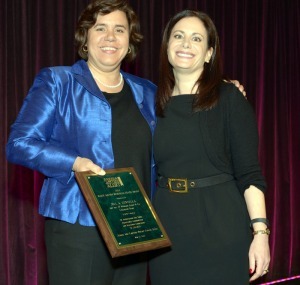 Jennifer G. Schecter and present awards. 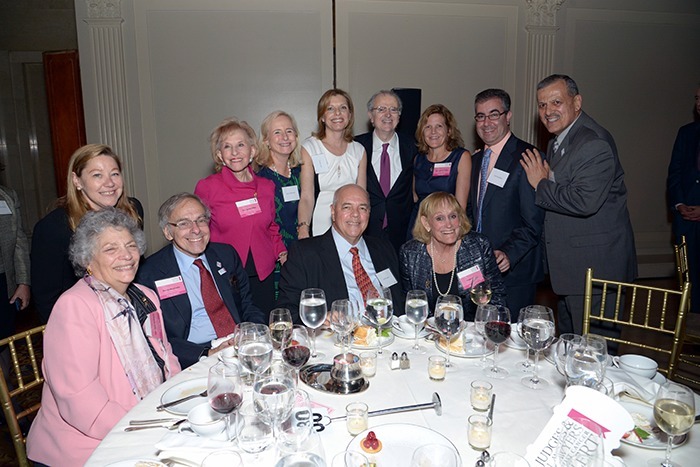 The event was organized by dinner Co-Chairs Sandra C. Katz and Cynthia B. Rubin, with the assistance of the Dinner Committee. Former Judge Judith Kaye presided over the installation of offices and directors. 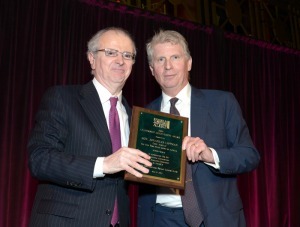 The Leadership Achievement Award was presented by Manhattan District Attorney Cyrus R. Vance, Jr. to Hon. 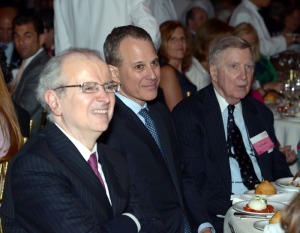 Jonathan Lippman, Chief Judge of the State of New York. Co-President Sharon Nelles presented the Maite Aquino Memorial Grant Award to Jill Centella and the JPMorgan Chase Litigation Team. 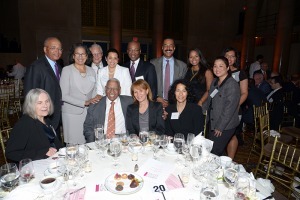 The award honors the memory of Maite Aquino, who had been a partner at Sullivan & Cromwell, and provides funds to community-based breast health programs and programs that provide legal and social support to families in crisis. Ms. Aquino died of breast cancer in June 2011 after a valiant fight against the disease. Hon. 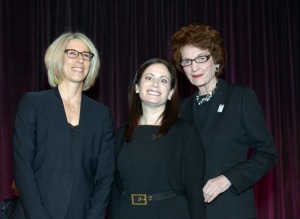 Lynn R. Kotler was installed as JALBCA’s new Co-President. She sits on the Criminal Court in Manhattan. 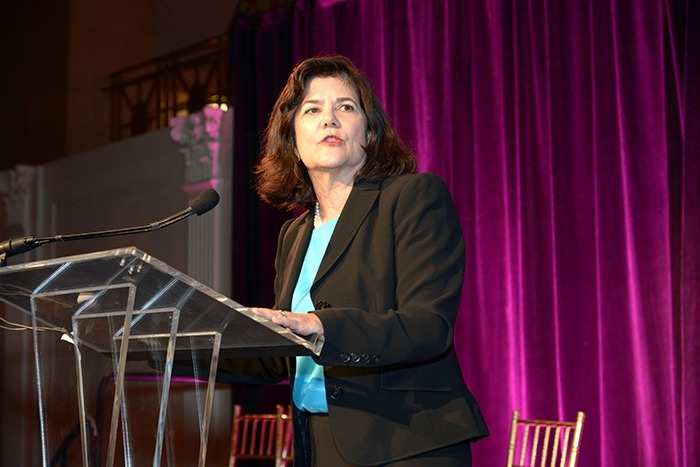 She will share JALBCA’s co-presidency with Sharon Nelles, a member of the law firm Sullivan & Cromwell LLP, whose term will continue. At its annual dinner, JALBCA installed and welcomed its new officers for the 2014-2015 year, as listed below. The newly elected members of the JALBCA Board and Advisory Board were also installed. Since 1998, health care consumers in NYS have had a right to an external appeal when their HMO or insurer (health plan) denies health care services as not medically necessary (including appropriateness, health care setting, level of care, or effectiveness of a covered benefit), experimental/investigational (including a clinical trial or rare disease treatment) or, in certain cases, out-of-network. The external appeal law was codified in Title I & II of Article 49 of the Insurance Law and Title I & II of Article 49 of the Public Health Law. Current external appeal regulations can be found at 11 NYCRR 410 (Regulation 166). External appeal cases are assigned to external appeal agents that are certified by the New York State Department of Financial Services and Health Department and have a network of medical experts available to review a health plan’s denial. The currently selected agents to perform this task are: Independent Medical Expert Consulting Services, Inc. (IMEDECS, formerly known as HAYES Plus, Inc.), located in Lansdale Pennsylvania, certified on June 21, 2001; Island Peer Review Organization (IPRO), located in Lake Success New York, certified on June 30, 1999; and Medical Care Management Corporation (MCMC), located in Bethesda Maryland, certified on July 2, 1999. To obtain an external appeal, the patient/enrollee must first appeal the denial with his/her plan, or the patient and the plan must agree to waive the internal appeal process. Applications for an external appeal must be filed within 45 days of the plan’s final adverse determination from the first level of appeal or from receipt of the plan’s letter waiving the internal appeal process. The NYS Department of Financial Services will presume that the applicant received the final adverse determination within eight days of the date on the determination, so that one has 53 days (45 plus 8) from the date on the final adverse determination to request an external appeal. Health care providers also may request an external appeal on their own behalf to obtain payment when a health plan makes a concurrent or retrospective adverse determination denying health care services. More information and applications are available from the Department of Financial Services or by calling 1-800-400-8882. The last annual report of the NYS Department of Insurance health bureau on the external appeals program that is posted on the NYS Department of Financial Services website is for calendar year 2005. The American Society of Clinical Oncology held its annual meeting in Chicago on May 30-June 3, 2014. 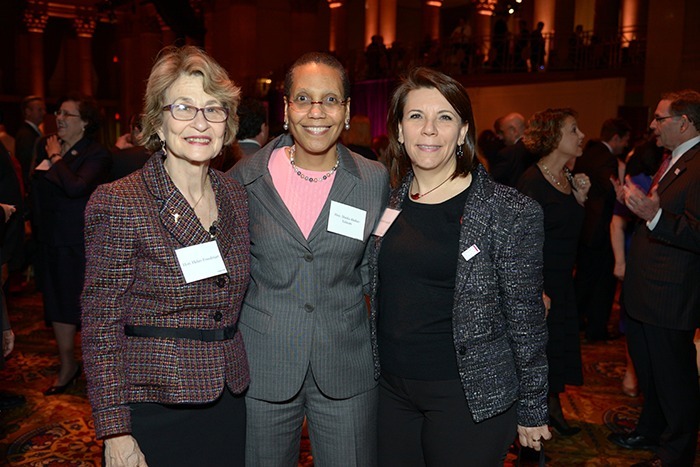 Following are some of the highlights from the meeting that were particularly relevant to breast cancer. An analysis of two phase III clinical trials showed that exemestane, an aromatase inhibitor, may be better than tamoxifen to prevent recurrence in women with early-stage hormone receptor–positive breast cancer. The two trials were the Tamoxifen and Exemestane Trial (TEXT) and the Suppression of Ovarian Function Trial (SOFT). The trial results showed that, when exemestane was combined with ovarian function suppression (OFS) in premenopausal breast cancer patients who have hormone-sensitive disease, there was a reduction in the risk of breast cancer recurrence by 34%, compared with treatment with tamoxifen in combination with OFS. The results were presented by study author Olivia Pagani, MD, of the Oncology Institute of Southern Switzerland in Bellinzona, Switzerland. Longer-term follow-up will be needed to assess overall survival, long-term toxicities and effects on fertility. Presently, tamoxifen is the standard adjuvant therapy for women with early-stage breast cancer, and it is used to prevent recurrence in those with hormone-sensitive disease. OFS is sometimes added to a tamoxifen regimen in higher-risk patients in countries outside the United States, but the combination is seldom used in the United States. The two trials followed a total of 4,690 women. The women were randomized to either exemestane or tamoxifen with OFS. The median age of the women in the trial was 43. The study used the drug triptorelin, surgical oophorectomy, or ovarian irradiation in order to achieve OFS. Some of the patients also received adjuvant chemotherapy, a decision made by their oncologists. In evaluating the safety of the exemestane versus tamoxifen therapies, adverse events were comparable with those of postmenopausal women. Depression, hypertension, and hot flashes were the most common. In the exemestane plus OFS patient group, musculoskeletal pain, vaginal dryness, libido decrease, dyspareunia, osteoporosis, and fracture were more common; in the tamoxifen plus OFS group, venous thromboembolism and hot flashes were more common. The phase III trials were coordinated by the International Breast Cancer Study Group, along with the Breast International Group and the North American Breast Cancer Group. The studies were also partially funded by the National Cancer Institute. A large study whose findings were presented at the ASCO meeting showed that obesity (defined as a body mass index [BMI] of 30 kg/m2 or higher) increases the risk of dying from breast cancer by a third. This only was observed, however, in premenopausal women with estrogen-receptor (ER)-positive disease. Study investigator Hongchao Pan, PhD, from the University of Oxford in the United Kingdom, and colleagues gathered data from the Early Breast Cancer Trialists’ Collaborative Group on 80,000 patients who participated in 70 early breast cancer trials. They evaluated BMI, ER status, menopausal status, age, recurrence, death, tumor diameter, and nodal status. Obesity seemed to have little impact on outcomes for postmenopausal women with ER-positive disease, a finding that surprised the researchers. Also, in ER-negative patients they saw no association between morbidity and obesity. The researchers also do not know the underlying mechanism to explain the association and acknowledge that the study did not prove a cause-and-effect link. affects tumor biology, including tumor proliferation, increased angiogenesis, and cell survival. It may also be that factors relating to treatment could have contributed to poor outcomes, e.g., obese patients are often underdosed for chemotherapy, with dose calculated based on calculated BSAs [body surface areas] rather than actual BSAs. These dose reductions have been associated with worse outcomes. Sharon H. Giordano, MD, MPH, of The University of Texas MD Anderson Cancer Center, provided these comments. She further noted other aspects of the trial: the non-randomized nature of the trial may have contributed to an imbalance in baseline characteristics; there was no adjustment for race and/or ethnicity, factors which could have affected the metabolic activity and outcomes in the study population; and the pooled analysis of women choosing to participate in clinical trials may also represent a selection bias because patients who participate in clinical trials, she said, tend to be younger, better educated, and healthier, and so the results may not reflect the general population. Members are reminded of upcoming community talks, screenings and programs offered by the NYU Cancer Institute, listed below. These take place at the NYU Langone Medical Center, NY, NY, unless specified otherwise. For additional information and future postings, please visit www.NYUCI.org. To RSVP, which is required, please call 212.263.2266 or e-mail NYUCIcommunityprograms@nullNYUMC.org. You may also reserve online. Prior programs are available for viewing on the medical center’s YouTube channel at YouTube.com/nyulmc. JALBCA Team co-leaders for the 2014 Susan Komen 5K Walk/Run Race for the Cure in Central Park, NYC will again be Hon. Shirley Werner Kornreich and Sandy Lespinasse. JALBCA thanks both Judge Kornreich and Sandy for their continued leadership and assistance in organizing our team for this annual event. To sign-up for the JALBCA team, please go to the Komen site online and register for the JALBCA team.